Alypso is a unique, naturally-derived surfactant that speeds up the infiltration of irrigation through thatch and into hard-to-wet soils often encountered on golf courses and athletic fields. Using Alypso helps turfgrass managers produce superior playing surfaces by moving water into the root zone and improving the uptake of soluble nutrients. 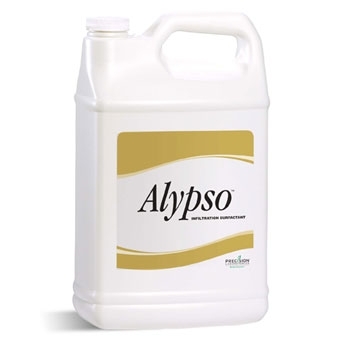 Apply 16 to 24 ounces (473 to 710 ml) of ALYPSO in a minimum of 60 gallons (227 L) of water to treat one acre (.40 ha). Monitor results to determine levels of water infiltration and adjust rate, up or down, in 2 ounce (59 ml) per acre (.40 ha) increments, until desired level of performance is achieved.